Biogas Products Ltd continue to bring innovative designs, simple and robust engineering and quality manufacturing to the biogas industry. They are proof that the knowledge and expertise needed to design and build biogas plants is right here in the UK. Their drive to be forward-thinking and respond to market demands has led to R&D of a new biogas upgrader using a 3-stage membrane technology. As a small business R&D can be a slow process, although we are confident we will be able to provide more information on our website very soon, we suggest you contact us to discuss our biogas upgrading technology further. Biogas is made up of approximately 60% methane (CH4), 40% carbon dioxide (CO2), water and small traces of other gases. Biogas is the product of a process called Anaerobic Digestion which quite simply is the natural breakdown of organic matter: green waste, household waste, agricultural waste or even some manufacturing waste. Different types of organic matter (or feedstocks) can affect the exact properties of the biogas. The process of upgrading biogas to biomenthane removes the carbon dioxide and other impurities from the biogas, effectively separating the methane from the other components. 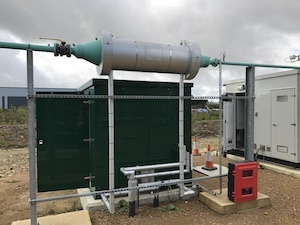 The biomethane, which is identical to Natural Gas, can then be injected directly into the gas grid network or it can be compressed to CNG or LNG for use as vehicle fuel. Tough new biofuel targets came into force in April 2018 which looks to double the use of renewable fuels in the UK transport sector within 15 years, cutting the sector’s reliance on imported diesel. Currently the industry, which supplies fuel to transport companies such as haulage firms and airlines, is only expected to meet a target of 4.75% biofuel this will be increased to 12.4% by 2030. At the same time, the government has challenged the sector to reduce greenhouse gas emissions by 6% by 2020 – supporting the UK’s low carbon fuel industry while helping make sure the UK transport sector is one of the most sustainable in the world.